The purpose of the Shuswap Watershed Mapping Project is to provide baseline information for future decision-making about proposed shoreline developments and a detailed accounting of existing shoreline development. 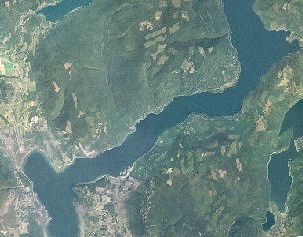 In 2009, Shuswap Lake and the surrounding watershed had over 1,100 pending development proposals. The Columbia Shuswap Regional District, Department of Fisheries and Oceans (DFO) and Provincial government agencies were under tremendous pressure to assess and make decisions on these proposals. This project will help agencies identify and monitor the ecological condition of the shoreline, evaluate resource values and explore conservation and restoration opportunities associated with shoreline habitats. This information will be useful for local, regional, provincial, and federal organizations when assessing development issues related to shoreline habitats. This project provides agencies and the public with an easily accessible source of map-based information for the shoreline, including land use, shore type, existing riparian condition and anthropogenic alterations. It will aid in developing land use policies, regulations and standards and is intended to increase long-term capabilities for protection of aquatic and riparian habitat within existing local government land use planning programs. The project builds on existing information sources and will serve as a benchmark for regulatory agencies by documenting current foreshore conditions, providing evidence for regulatory investigations and monitoring objectives set out in foreshore protection initiatives. In 2011, Shoreline Management Guidelines for Fish and Fish Habitat on Shuswap, Mara and Little Shuswap Lakes were finalised by DFO, working in cooperation with the BC Ministry of Natural Resource Operations and the Shuswap Lake Integrated Planning Process Foreshore Development Interagency Technical Committee. These risk-based guidelines allow proponents and qualified professionals to proceed with common, low-risk works without review by DFO, but require specific, detailed design and assessment information to be submitted for review by DFO for less common, higher-risk works. These guidelines should clarify and streamline land use decision making processes between different agencies and stakeholders as they relate to fish and fish habitat on Shuswap, Mara and Little Shuswap Lakes.